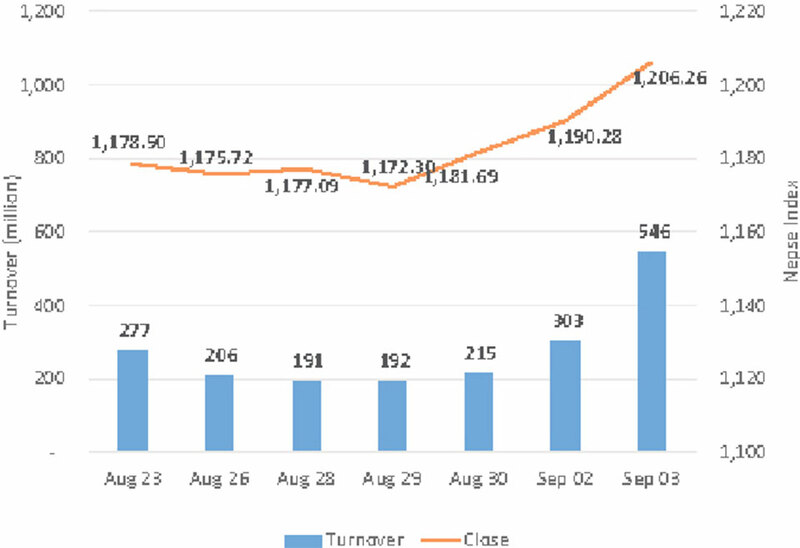 KATHMANDU, Sept 4: The sole equity market of Nepal witnessed a broad rally since the beginning of Monday's session. 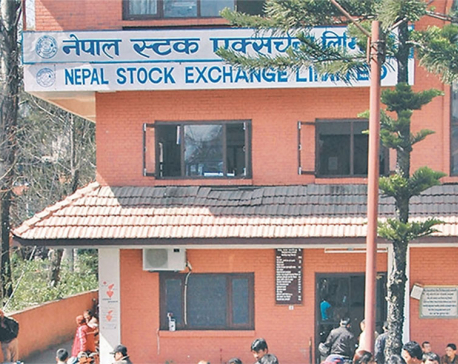 Following the surge, the Nepal Stock Exchange (Nepse) Index gained more than 23 points to reach to an intraday high of 1,213.86 in the afternoon. The market retraced slightly toward the session's end but still managed to close with a gain of almost 16 percent on the day. The index settled at 1,206.26 points. The broad gain came on the back of upbeat investor sentiments following two straight days of gains. Market participation showed a massive improvement as total turnover increased by over 80 percent to Rs 546 million compared to the preceding session. Sectoral performances mirrored the bourse's movement on the day. Most of the major sub-indices closed higher, while only Hotels and 'Others' sub-index posted a modest drop. Significant strength was visible among Manufacturing/ Processing stocks as its sub-index surged by 4.32 percent. Non-Life Insurance sub-index closed 1.67 percent higher. Banking stocks also showed a substantial move to the upside as its sub-index rose 1.52 percent. Sub-indices of Hydropower and Life Insurance stocks also added more than 1 percent on the day. Nepal Life Insurance Company Ltd's scrips continued to trade actively. It led the list of top turnover stocks as Rs 112 million worth of its shares changed hands. Besides, mainly commercial banks dominated the list of active stocks. Stocks of NIC Asia Bank Ltd, NMB Bank Ltd and Nepal Bank Ltd registered turnovers of Rs 33 million, Rs 24 million and Rs 19 million, respectively. Other top turnover scrips include Janata Bank Nepal Ltd, Sanima Bank Ltd and Mega Bank Ltd. Among the advances, stocks of Laxmi Bank Ltd posted the biggest percentage gain on the day as its rally managed to close just below the positive circuit of 10 percent. The commercial bank is on its course for merger with Everest Bank Ltd. Kabeli Bikas Bank Ltd also saw its share price surge 9.64 percent after the development bank announced 35 percent bonus shares to its shareholders on the day. Similarly, shares of Global IME Laghubitta Bittiya Sanstha Ltd and United Modi Hydropower Ltd jumped 8.48 percent and 7.41, respectively. Hathway Finance Company Ltd and Uniliver Nepal Ltd were the other top gainers. In contrast, Ngadi Group Power Ltd posted the worst performance of the day as its share price tanked 7.95 percent. Mutual fund units of Siddhartha Equity Oriented Scheme and Global IME Sammunat Scheme-1 also witnessed falls of almost 4 percent. Shares of Tinau Development Bank Ltd, Radhi Bidyut Company Ltd and Kailash Bikas Bank Ltd also shed values on the day. On the announcements front, Mirmire Laghubitta Bittiya Sanstha Ltd declared 24 percent bonus shares to its shareholders as per its notice to Nepse on Monday. Following the news, its share price rallied 6.29 percent on the day. As per the ARKS technical analysis the index added to its gaining streak on the heels of improved market activity on Monday. The index also managed to cross its immediate resistance of 1,200 points. Relative Strength Index (RSI) and Moving Average Convergence Divergence (MACD) indicate the market is slightly favoring the bulls at present. The index can be expected to continue on its course upwards if it holds its ground above the 1,200 points level supported by substantial volume in the upcoming sessions.